We've got a huge share for everyone this week! Fall is here, and cold nights and frosty mornings are slowing down the garden and bringing an end to the season. 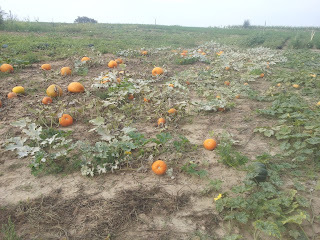 We still have a lot of harvest though and a few fall specialities like pumpkins this week! This will be our second to last share so enjoy, and we'll see you all next week for our finalé. 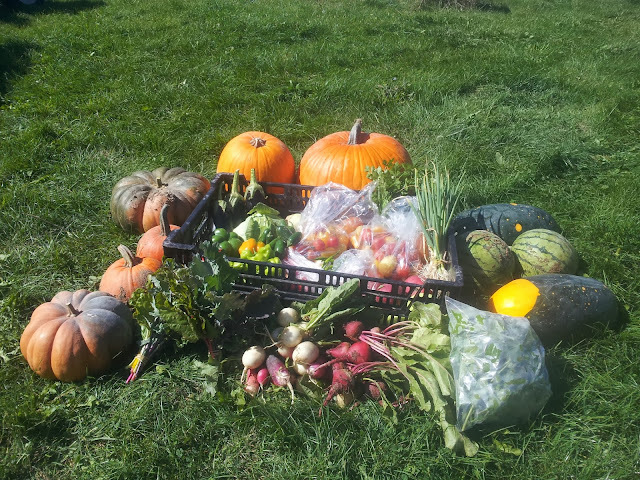 Fall is upon us and this week our CSA members get the first of the pumpkins! Full Shares get 2 Jack-O-Lantern pumpkins for carving, 2 Pumpkin Pie pumpkins (the small round ones) and 2 Musque de Provence (the lobed, cinderella-like pumpkin). Both the pumpkin pie and musque de provence pumpkins can be used for making pumpkin puree for pumpkin pie made from scratch! Now say pumpkin 10 times in a row. Many more watermelons this week! We've got two heirloom varieties for everyone this week, the Moon and Stars, named after the yellow spots that develop on the outside like, well, moon and stars. The other variety is a smaller, round watermelon called Cream Saskatchewan which has sweet white flesh but a very thin rind. So handle with care, we had a few pop and break on us! Did you know, A USDA study found that the tart white rind of watermelons offers a high dose of citrulline, an amino acid that helps dilate blood vessels to improve circulation. You can make a yummy drink out of the rind, check here for some ideas. This week every full share will get 4 of our heirloom melons. These make great snacks and are some of the sweetest melons you will ever eat. Eat these fast because they don't have a long shelf life! More apples for everyone this week! We recently met the farm's previous owners and learned which varieties we have. This week we have 4 MacIntosh and 4 Golden Delicious for our Full Shares. Our tomato plants are heavy with ripening fruit for everyone to enjoy this week! 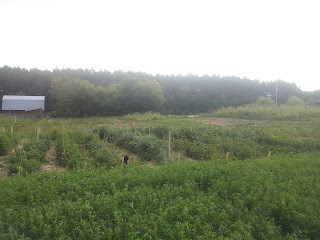 We've had two light frosts already however, and the plants are feeling it, this may be our last week for tomatoes! We recommend whipping up some salsa since we have lots of jalapenos and other peppers to go with these tomatoes. Check our 2013 Tomato Varieties blogpost to see which ones you get and match the tomato to it's name! For using all these tomatoes, we recommend making lots of salsa, tomato salad and bruschetta. We've been glad to hear that many of your have been doing so! Now is the time to start preserving the harvest folks! Freeze some bruschetta, can some salsa or marinara sauce! To use up those bell peppers and jalapenos, try canning some delicious zesty salsa! We've got lots more peppers for everyone this week! You can use the bell peppers, habaneros, and Jalapenos in the zesty salsa recipe. We have lots of bell peppers for you this week, we recommend them for the salsa, or try some stuffed bell peppers! If you don't end up using them all, preserve the harvest! Here's a handy site with all sorts of ideas for preserving your bell peppers. Habaneros are new for us this year, try some Jerk Chicken with a Mango-Habanero Sauce, or Habanero-Lime Cheesecake! 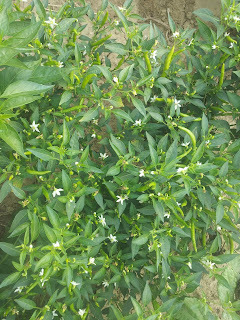 We've also got Thai Peppers for everyone this week, small green peppers that are very hot! Try some Pad Thai or Thai Pumpkin Soup with these. More Kohlrabi this week! Just peel the skin and bite into it like an apple, or slice it and enjoy with your favorite salad dressing. A little more green onions for everyone this week. With a milder taste than onion, you can use both the small bulbs and the green stem. We love to use green onions on salad, in soups, as a pizza topping, in salsa, or in stir-frys. Tip: You can also make your green onions last longer by putting the exposed roots in an inch of water in a container in the fridge. We have some beets finally this week as well. This root crop is one we are still learning to love ourselves. The most common use we know of is Borscht a eastern european soup. Many people like to shred them to add to a salad. And our friend Roger Kammers of Hamblin Auto Body likes to pickle them as a special snack! This week our shares get to enjoy kale and more Swiss Chard. Swiss chard is another extremely healthy green that helps regulate blood sugar and a great source of anti-oxidants. Try the swiss chard as a side dish, with this easy Savory Swiss Chard recipe. Our favorite way to enjoy these greens is by tearing the leaves into strips and sauteing them in olive oil and garlic with some salt, pepper, and red pepper flakes. This week we have more Arugula for you! Add these to your lettuce heads or make them a meal in themselves. Want to splurge on a delicious salad? Add pine nuts and crumbled goat cheese with sunflower oil as your dressing, you won't regret it! We also like making sandwiches with the mix. We had some great bread from the farmer's market, smeared some goat cheese on the bread and stuffed it with arugula and it was excellent! The heat has plumped up this fall planting of radishes! This week we have 2 varieties for you, the white Ping Pong radish and the longer red French Breakfast variety. We really like the French Breakfast, its a little sweeter and milder in taste, great for getting your kids to try out radishes. Our favorite snack is lightly toasted bread with butter and sliced radishes, give it a try! Don't forget, you can use those greens! Sautee them for 2-3 minutes in garlic and butter, or make one of our favorite soups Radish Leaf Soup, we like to substitute homemade stock for the water to give it extra flavor! This week we have 3 Eggplant for full shares only, they've been slowing down with the cold and not producing enough for everyone. 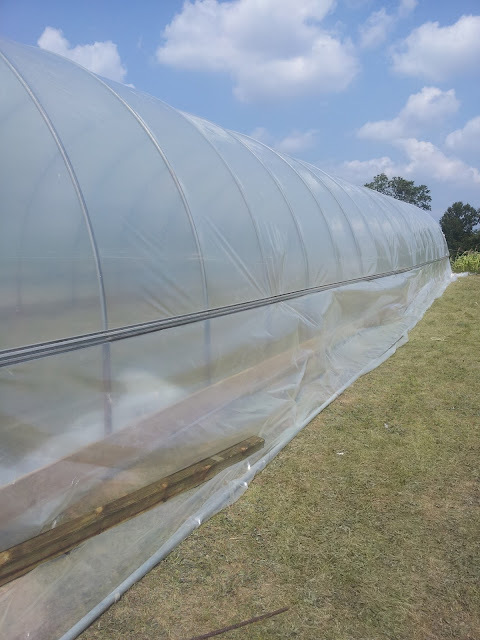 Next year we'll have more eggplant for longer, we'll be starting them inside our new greenhouse and growing some inside as well for an extended harvest! Eggplant is in the same family as tomatoes and potatoes and was first domesticated in India. We have the large black Italian variety, perfect for ratatouille or eggplant parmesan. Raw eggplant can have a somewhat bitter taste, but becomes tender when cooked and develops a rich, complex flavor. The flesh is smooth and meaty, capable of absorbing large amounts of cooking fats and sauces, making for very rich dishes and making it a great meat substitute for vegan and vegetarian dishes! This week we have cabbage heads for our full shares. These store well, and we've been enjoying them in eggrolls. We shred up 2 cups cabbage, 1/2 c carrots, 1/2 c radish, and 1/4 c sprouts, some green onions, then adding 1-2 tbsp of soy sauce and rolling 2 tbsp of the mixture in egg roll wraps. Fry it in peanut or canola oil and enjoy! We've got another huge share for everyone this week! New items include bell peppers, cayenne peppers, and cabbage for our full shares. 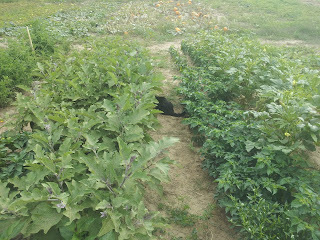 We had our first light frost on Monday morning, damaging some of our summer squash and okra plants. 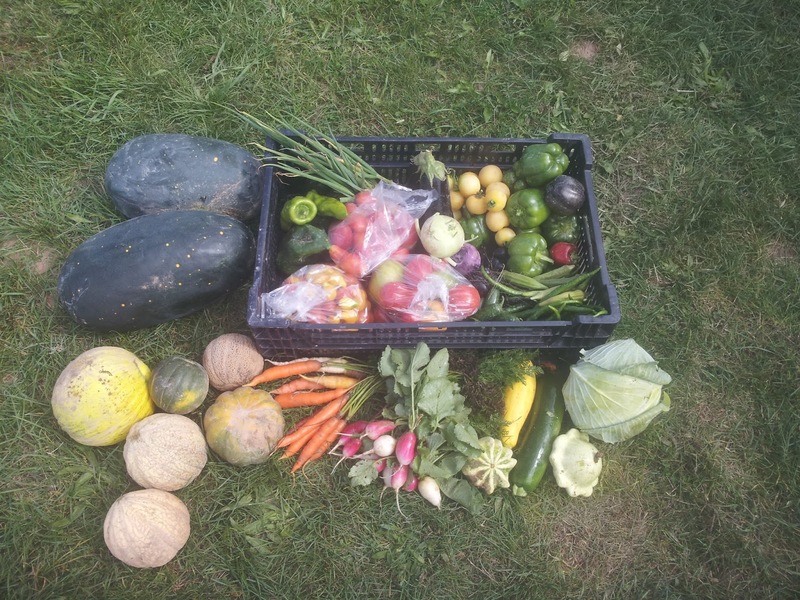 But the garden is still full of produce for our shares, so enjoy and preserve the harvest while you can! 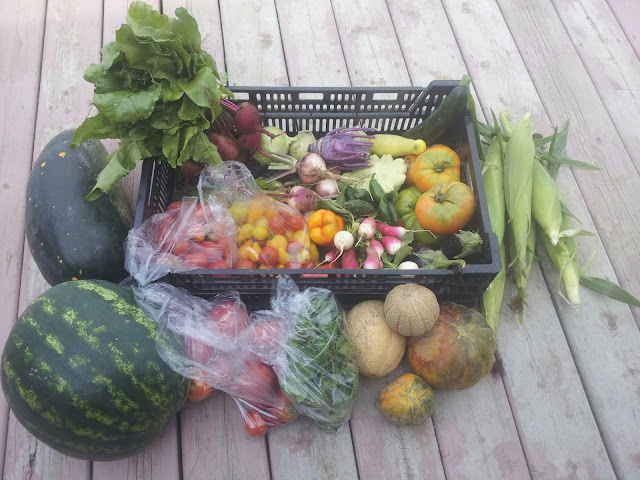 Full Share Pictured: 2 Watermelon, 6 Melons, 3 lbs snacking tomatoes, 14 Peach tomatoes, 3 lbs roma, 2 slicers, 2 lbs rutgers, 2 kohlrabi, large bunch green onions, 3 lbs bell peppers, 16 cayenne peppers, 12 jalapenos, 4 poblano peppers, 2 beaver dam peppers, 6 okra, large bunch carrots. Also for Full Shares only: 1 head cabbage, 4 summer squash, bunch of radish, 2 eggplant. This week every full share will get 6 of our heirloom melons. The small cantaloupe make great snacks and are some of the sweetest melons you will ever eat. Eat these fast because they don't have a long shelf life! This week full shares get to try a new melon, the Casaba (the yellow one in the bottom left corner) a muskmelon from Turkey with a milder, more cucumber-like taste with a longer shelf life! More watermelons this week, and everyone gets to try the heirloom variety Moon and Stars, one of our favorites, named after the yellow spots on the outside. Full shares get two of these monsters! Our tomato plants are heavy with ripening fruit for everyone to enjoy this week! We recommend whipping up some salsa since we have lots of jalapenos and other peppers to go with these tomatoes. Check our 2013 Tomato Varieties blogpost to see which ones you get and match the tomato to it's name! For using all these tomatoes, we recommend making lots of salsa, tomato salad and bruschetta. Now is the time to start preserving the harvest folks! Freeze some bruschetta, can some salsa or marinara sauce! To use up those bell peppers and jalapenos, try canning some delicious zesty salsa! We've got lots of peppers for everyone this week. We were hoping to let the peppers mature and turn colors, but after we had a light frost on Monday morning, we decided best not to chance it. You can use the bell peppers, Poblano, Beaver Dam and Jalapenos in the zesty salsa recipe. We made some delicious chiles rellenos with the Poblano and Beaver Dam peppers, served over rice with a tomato sauce. As for the cayenne peppers, we recommend hanging them by their stems in a dry, well-ventilated area and drying them for spices later in the year, who doesn't like red pepper flakes on sauteed kale? Or if you want to go the quicker route, you can dry them in the oven for powder or flakes, try this recipe. We have lots of bell peppers for you this week, we recommend them for the salsa, or try some stuffed bell peppers! If you don't end up using them all, preserve the harvest! Here's a handy site with all sorts of ideas for preserving your bell peppers. More okra this week! A southern favorite, that we are growing to love. We used our okra by dicing it with a jalapeno and adding it to our favorite cornbread mix. Okra can also be grilled, sauteed, fried, stir-fried or added to soup. Some don't like okra because of its sliminess, but try adding an acidic ingredient or cooking it whole to minimize the sliminess. Here are a few recipes to try! More carrots this week--eat them on salad, in soup, or just raw, you can't go wrong! And for the kids who don't like to eat their carrots, you can always entice them with Carrot Cake or Carrot Scones! Our summer squash are winding down, and this may be the last share they'll be in. We've got 4 summer squash for our full shares, a mix of zucchini, yellow crookneck and scallop squash. Here's a great resource for recipes for the Scallop (UFO-shaped) variety, try it pan-fried, grilled, steamed, sautéed, baked, roasted or shredded raw! This week we have 2 Eggplant for full shares only, they've been slowing down with the cold. Next year we'll have more eggplant for longer, we'll be starting them inside our new greenhouse and growing some inside as well for an extended harvest! Eggplant is in the same family as tomatoes and potatoes and was first domesticated in India. We have the large black Italian variety, perfect for ratatouille or eggplant parmesan. Raw eggplant can have a somewhat bitter taste, but becomes tender when cooked and develops a rich, complex flavor. The flesh is smooth and meaty, capable of absorbing large amounts of cooking fats and sauces, making for very rich dishes and making it a great meat substitute for vegan and vegetarian dishes! This week we have cabbage heads for our full shares. These store well, and we've been enjoying them in eggrolls. We shred up 2 cups cabbage, 1/2c carrots, 1/2c radish, and 1/4c sprouts, some green onions, then adding 1-2 tbsp of soy sauce and rolling 2 tbsp of the mixture in egg roll wraps. Fry it in peanut or canola oil and enjoy! Holy moly this one's a big one! It is officially harvest season and the shares are proving it. This week we have pounds of tomatoes, a few melons per share, a few watermelon, sweet corn, peppers, beets, green onions, kohlrabi, beets, okra, eggplant, and arugula. Special to full shares this week we have summer squash, a cucumber, a bell pepper, a beaver dam pepper, turnips and radishes. I'm going to keep this short because harvesting all this was EXHAUSTING! We also have the first of our watermelons this week! We have three varieties: Crimson Sweet, a white-fleshed Cream Saskachewan, and Moon and Stars. Full shares get to enjoy 2 of these giants! So we finally have our sweet corn! Unfortunately we don't have nearly as much as we want so enjoy it this week because it may be the first and last week of the sweet corn. The corn was devastated by the severe rain we had a few weeks back and much of it was knocked flat. We have a few varieties of sweet corn, and if you're really lucky you may get one of the very few ears of Red Queen sweet corn. Otherwise you may get a white, yellow or bi-color variety. Eat the corn any way you like, Farmer Fahler was snacking away on some of the undersized or ugly ears raw. We also like to add the kernels to our salsa to give it a little sweet to match the spicy. This week we have Eggplant for everyone. Eggplant is in the same family as tomatoes and potatoes and was first domesticated in India. We have the large black Italian variety, perfect for ratatouille or eggplant parmesan. Raw eggplant can have a somewhat bitter taste, but becomes tender when cooked and develops a rich, complex flavor. The flesh is smooth and meaty, capable of absorbing large amounts of cooking fats and sauces, making for very rich dishes and making it a great meat substitute for vegan and vegetarian dishes! Our tomato plants are heavy with ripening fruit for everyone to enjoy this week! We recommend whipping up some salsa since we have lots of jalapenos to go with these tomatoes. Check our our 2013 Tomato Varieties blogpost to see which ones you get and match the tomato to it's name! For using all these tomatoes, we recommend making lots of salsa, tomato salad and bruschetta. Now is the time to start preserving the harvest folks! Freeze some bruschetta, can some salsa or marinara sauce! More peppers this week! 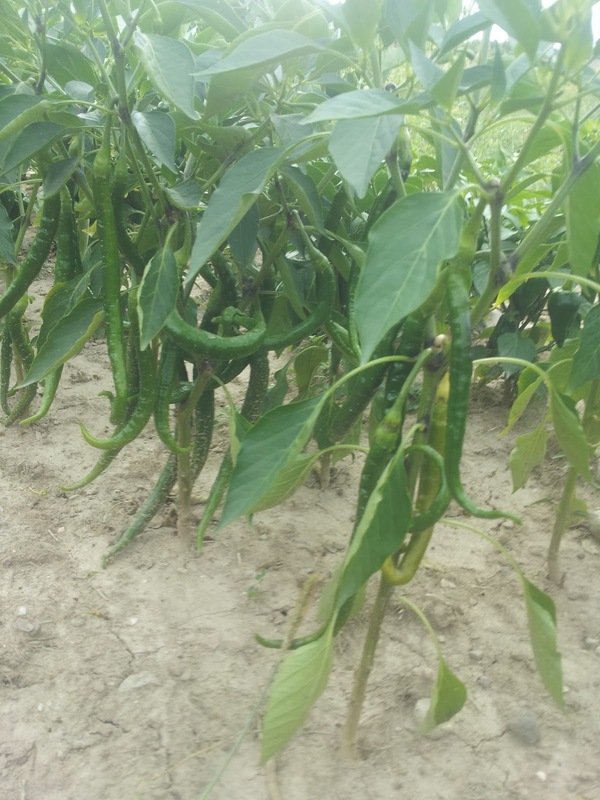 Everyone will find Jalapenos in their share this week. 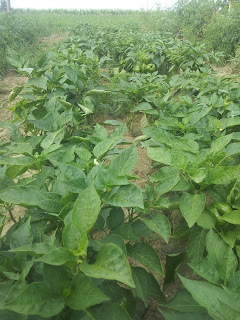 Full shareholders will also see a bell pepper and a Beaver dam or Poblano pepper. We always like to use jalapenos in our salsa or guacamole. But we also experimented with adding diced Okra and Jalapeno to our favorite Cornbread recipe and were delighted by the result! The bell and beaver dam peppers are a great addition to your salsa as well. 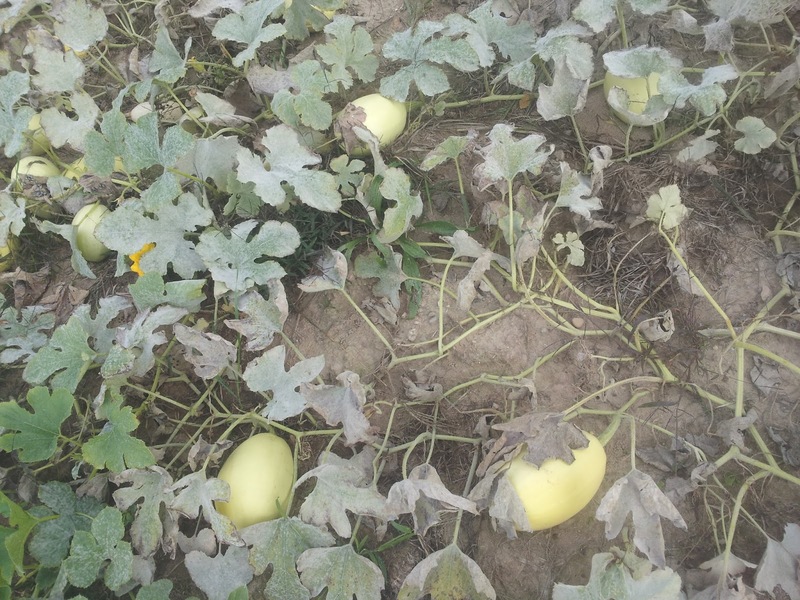 Our summer squash are winding down, and this may be the last share they'll be in. The Yellow Crookneck and Scallop squash are still producing, so try sauteing or grilling these squash. For full shares this week we have a scallop, zucchini and yellow squash! Enjoy the slight melon-like taste of cucumbers in any sandwich. Cucumbers go well with dill, fish, and egg dishes. Try an Egg and Cucumber sandwich, or an old british tea party favorite Cucumber sandwiches. For these sandwiches, the spread can be yogurt, mayonnaise, butter, or cream cheese, try it with a sprig of dill or mint. Perfect for a hot day! It looks like we've seen the last of the lemon squash for this year, alas! Store your turnip roots in a bag in the fridge for up to one week. As for cooking the roots, Farmer Figgins has always heard that most of the flavor is in the skin, but most recipes call for peeling it off, but you guys make the call. You can substitute turnips for potatoes in most recipes, including our Creamy Fall Vegetable soup, or you can try them mashed like potatoes with chives and bacon! So this week we finally had enough time to get to work on our big project of the summer. 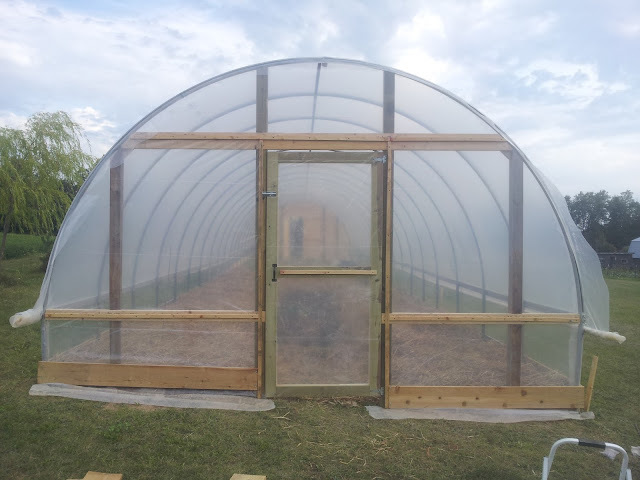 This spring we picked up a greenhouse from the local florist Sid's Flower Shop. It is a 72' x 15' steel high-tunnel greenhouse. 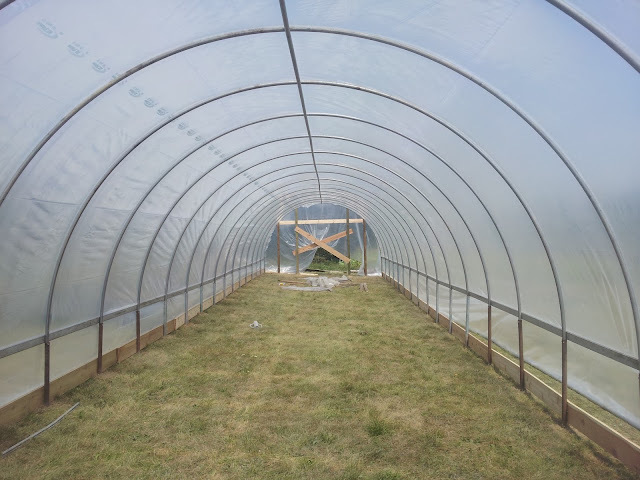 Luckily Farmer Fahler's family, came out from Colorado to give us a hand with the project, which was much needed as my History degree did little to help with this scale of a construction project. We began by laying out all the peices and seeing how it would all fit together. Using a post hole digger to set our foundation poles. 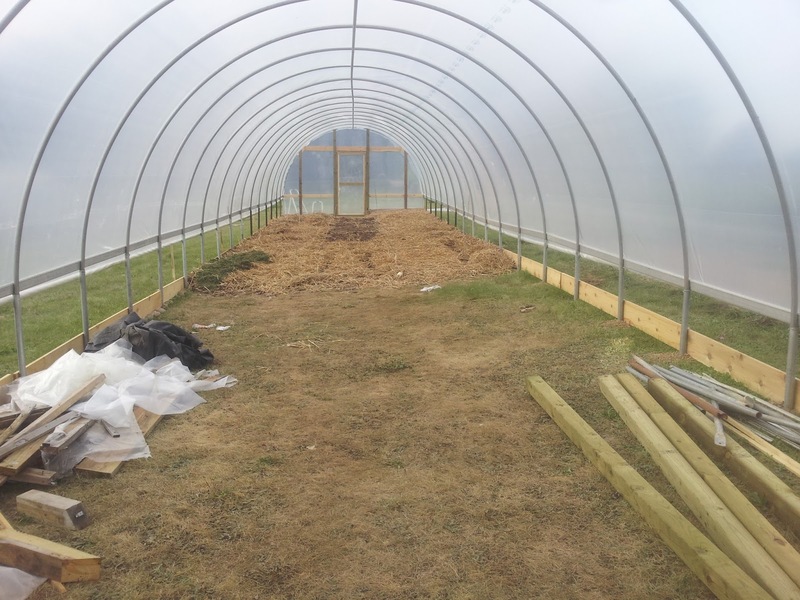 We framed in the ends and sides and then using the help of everyone began to pull the plastic over the whole length of the greenhouse end to end. Even Mom was helping with her foot in her walking cast. And finally we were able to secure the back side which will have a 6' barn door and plywood covering. All wrapped and secured. Now to just hook in the roll up bars on the sides. Lot's of growing space, now to fill in with compost and topsoil! Filled about 2/3 leaving us the north end to start seeds in spring. A close up look at the fill, a mix of topsoil, compost, and a straw mulch with fresh grass clippings. The fall is at its peak now, producing lots of produce for our CSA members. It's been a challenging year in the garden, with wacky weather and plenty of insect and disease pressures. But each challenge is an opportunity to learn, and we've been doing plenty of that! In the garden our long-season crops are starting to come in--tomatoes, eggplant, peppers, and melons. And some of our summer crops are winding down, naturally and due to disease pressures--our cucumbers, summer squash and green beans. We have had quite a bit of disease pressure on the farm, the conditions have been ripe for it with cool nights and long dew periods, and the prevalence of the diseases in the area. 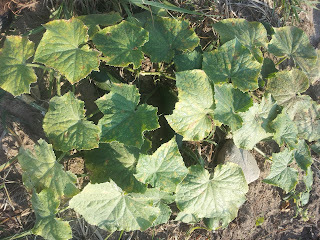 We have seen a lot of powdery mildew and downy mildew--on the summer squash, the cucumbers, the melons, winter squash and the pumpkins. We tried spraying Neem Oil, an organic fungicide made from Neem trees, for over a month, but the diseases kept on unabated. reducing their yields, but there will still be plenty of pumpkins for Halloween! 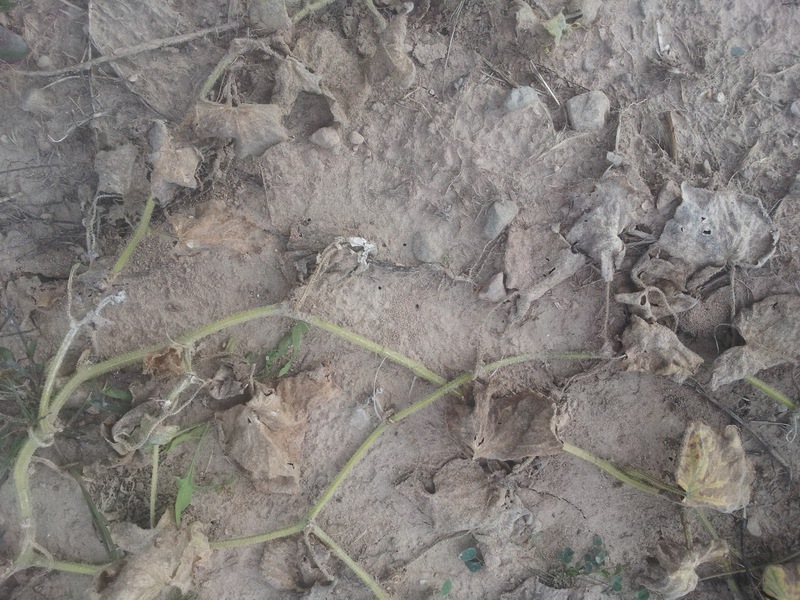 We also found a soil-borne fungus called Verticillium Wilt in some of our watermelon patches, killing the plants before the fruits were ready. The leaves wilt on half of the plant, moving from older leaves to newer, then moves to the other side and finally kills the plant. It has a wide host range, effecting 200 different plant species and stays alive in the soil for 4-6 years. 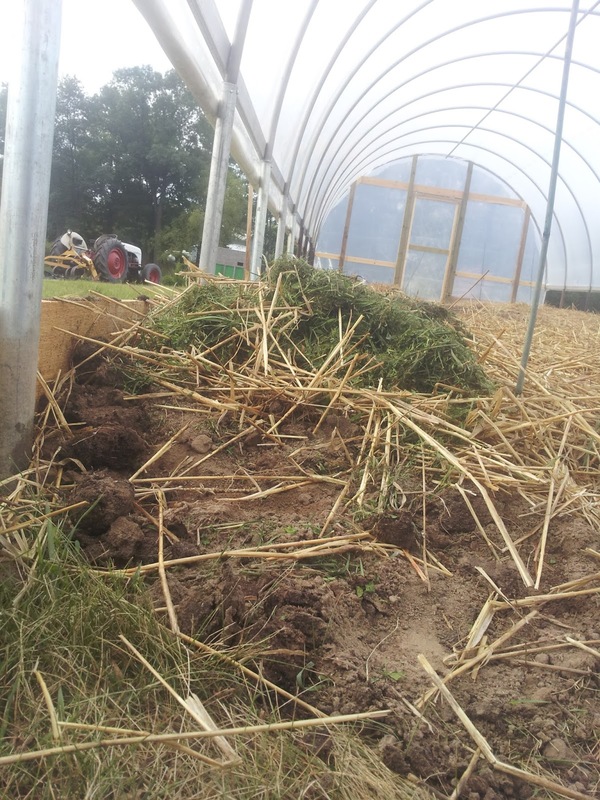 There's little to be done about it with conventional or organic methods, but we tried adding an organic biofungicide called Root Guardian to the remaining plants to bolster their root systems. Long-term, we'll be monitoring the area to see the extent of the infection, if its a small localized area, we may solarize the soil to kill the fungus, or we will be moving the garden to another spot. Insect pressures have also been challenging this year, they flourished in the wet spring and fattened themselves in the garden. 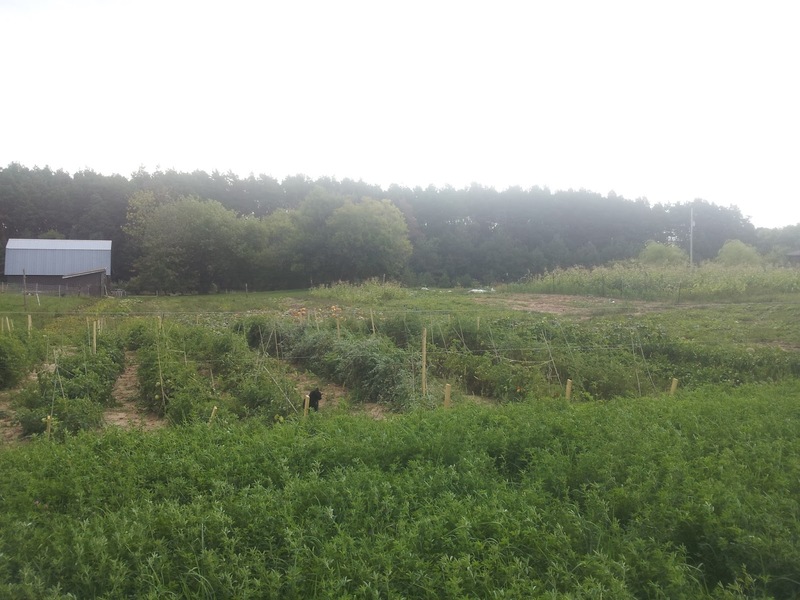 We've had turnip maggots, flea beetles, Colorado potato beetles, Squash beetles, Squash vine borers, tomato hornworms, and Japanese beetles. Luckily, while we've suffered damage from these bugs, we've generally been able to mitigate their damage or eradicate them, so we haven't lost too many crops to insects. Elsewhere in the garden things are growing and ripening, our solanaceae crops (peppers and tomatoes) are heavy with fruit and flowers, and our fall planting is growing well. 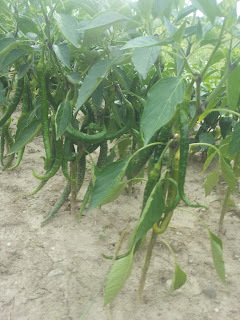 Joe's Long Cayenne Pepper, just waiting on them to change color! Our tomatoes have been producing nicely, hopefully the weather will hold for a longer harvest! Orange Thai Peppers, not quite orange yet. We did manage to plant a fall crop this year, including some radishes, turnips, carrots, kohlrabi, snap peas, and shelling peas, and beets. Both the peas are starting to flower, but we can tell the difference between the plantings, the snap peas are in our first planting area, and only about half the height of the shell peas, in the center of the field. 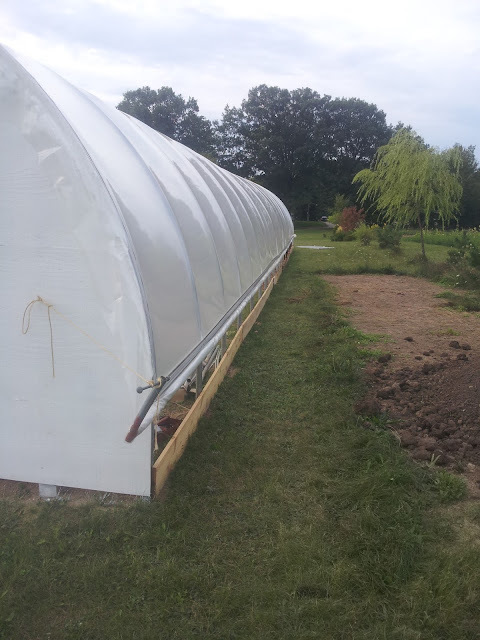 Based on yield and growth we've realized that our first planting, where we had our first cold season crops and root crops, the soil was not prepped enough, stunting plant growth, especially for our root crops. Simply: because it wasn't cultivated enough, the roots couldn't penetrate deep enough into the soil, with restricted root growth there is restricted plant growth. 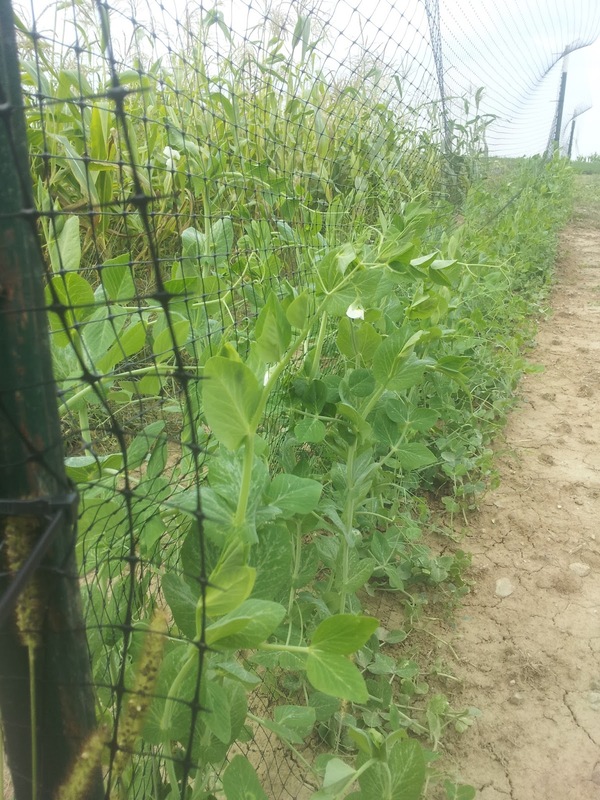 Our shelling peas, starting to flower and looking great! The corn is a week or so from picking! Some of it got knocked over and battered around by series of violent thunderstorms and 4" of heavy rain we got last week. 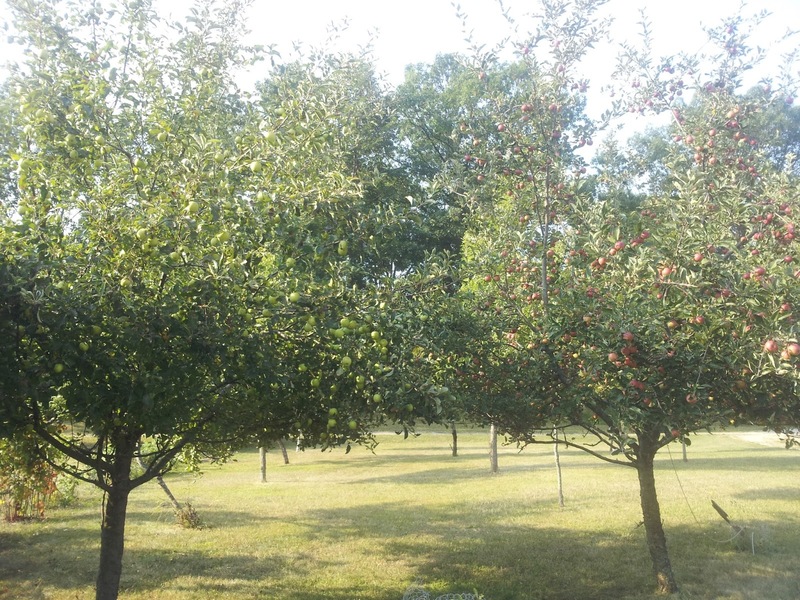 The Orchard is producing lots of apple this year, which we've been happy to share with our shareholders! We'll be canning apple pie filling and applesauce, and fattening the pigs with the rest! Our dry beans are ready to harvest! We've already started shelling some at Farmer's Markets, but there's more to go! In the field the animals have been growing! 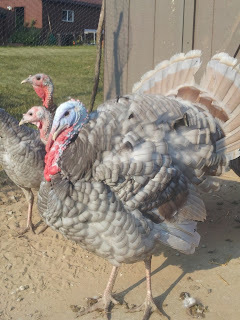 Our male turkey, Tom, loves displaying his feathers and gobbling at us when we pass in tractor or car. Among his harem of ladies, two turkeys--Waldo and Thanksgiving--are always hopping the fence and running around trying to get back into their enclosure. We let them all free range on occasion, but this usually results in them wandering out to peck at green onions in the garden, roost in a tree out of reach, or wander out to the road. We've sold out of our pasture-raised chickens and have started selling our pasture-raised pigs. They'll be going to the processor in October and November, so reserve yours now! Rosie is on a vacation at Shamrock Acres Dexter Farm in Hudsonville, MI to be bred, we'll be picking her up at the end of the month! Waldo trying to get back in. 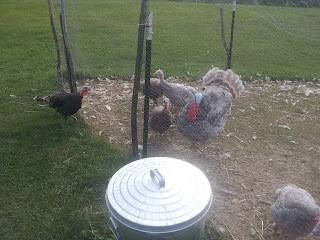 We have their feed bin placed next to their pen in hopes she'd learn to hop over, but she hasn't learned that trick yet. 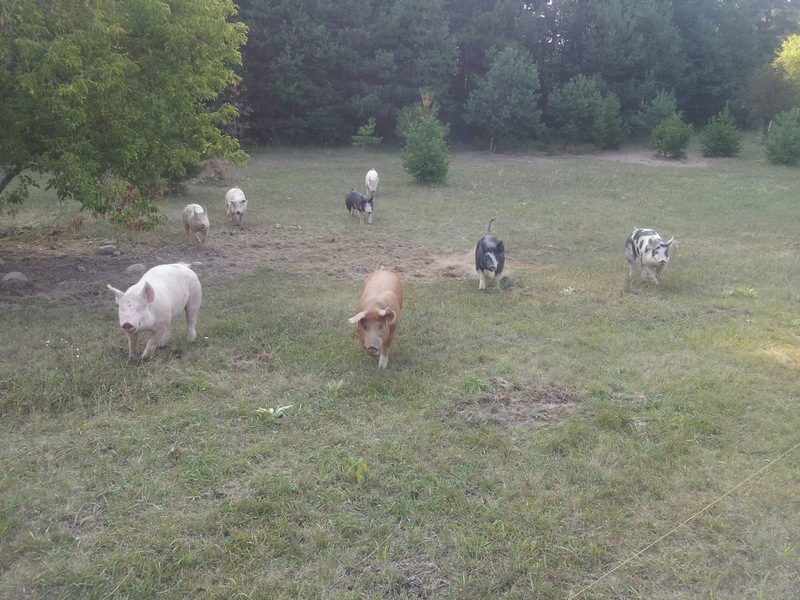 We moved the pigs to another pasture, they have about 3 acres to themselves, and they've been rooting up the pasture, helping us prep the land for reseeding the pasture next year. 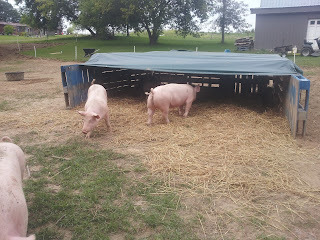 Their pallet shelter has held quite well so far this summer, we've only had to replace the tarp once. 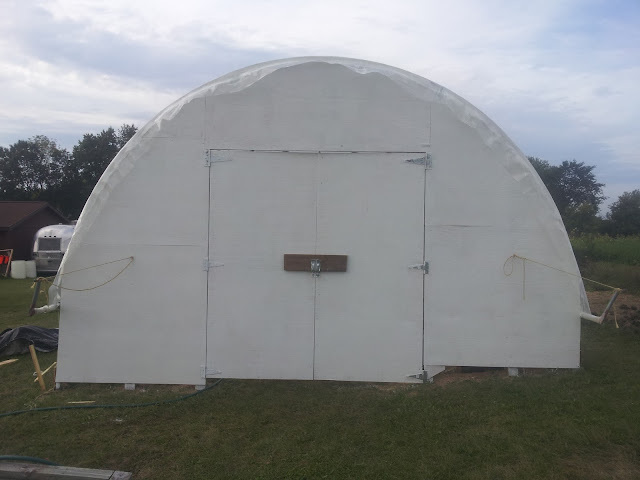 We'll be getting more sturdy quonset huts for the winter that we can then move and use all year long next year. Pig Pen Made out of Pallets! Shire Farm's Pasture Farrowing "E-Hut"
Goat Cheese and Spinach Ravioli from Scratch! “Hobbits have been living and farming in the four Farthings of the Shire for many hundreds of years quite content to ignore and be ignored by the world of the Big Folk. Middle-earth being, after all, full of strange creatures beyond count Hobbits must seem of little importance being neither renowned as great warriors nor counted among the very wise. In fact, it has been remarked by some that Hobbits' only real passion is for food. A rather unfair observation as we have also developed a keen interest in the brewing of ales and the smoking of pipe-weed. -The Fellowship of the Ring, The Movie.